There is a no doubt that a tomato is a nutrient dense, super food that all people around the world are eating more everyday. Tomatoes are full pack of vitamins A and C and folic acid. Tomatoes contain a wide array of beneficial nutrients, fibers and antioxidents. It aids to reduce weight. It helps to lower Blood pressure. added onions, red chillies cut, curry leaves, turmeric powder. allow to cook for10 minutes. 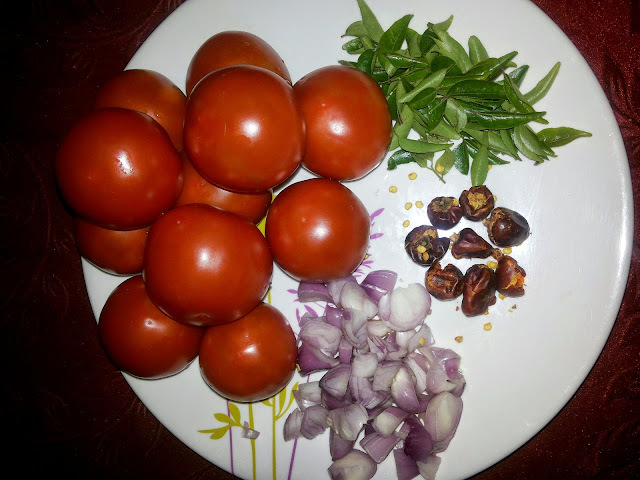 Add chopped coriander leaves.Tomato curry is ready to serve with hot rice and ghee or gingelly oil.